All hail the Great Rodent Oracle of Umbral News Delineating Hiems' Oncoming Goodbye! Let's hear it for Marmotine Sciamancy! Or at least Marmitine Sciamancy. . . I hath fallen in love with throat/overtone singing. Are you trying to do it, or are you in the amazed observer camp? Good, because throat singing is fantastic, I sometimes do it myself to calm myself. Pff, no, I can never do it, so amazed observer camp I am. Thank goodness. I was worried no one would appreciate Punxsutawney Phil's full title. After all, us rodents gotta stick together. Is it? I haven't tried this brand of divine invocation. 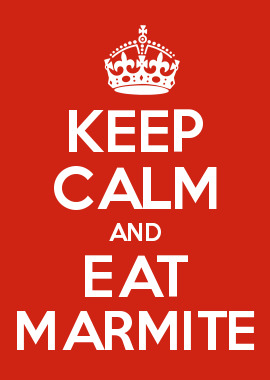 Well, I'll take Marmite spread over spread marmote any day of the week. Except Thursdays. That's Deep Fried Marmote Day, and no one, I say, I say, no one misses Deep Fried Marmote Day! Seriously, Marmite is one of those quaint foods, so quintessentially British, so horrific is it's taste it's actually kind of quite good. I actually survived two slices of toasted bread spread with the stuff, for which I was knighted for going (well) above and beyond the call of duty on behalf of British culture. Lest I lead thee further down the garden path, Marmite is actually the deepest soul of umami. Umami personified. Umami deified. I've got some recipes I want to try it in. In small quantities and mixed with other foods, it's actually quite safe to handle and even consume. Hmmm...marmite basted roasted marmote anyone? Hmm??? Well… I did have roasted cuy on a spit in . Little bits of meat; lots of bone, not unlike hot wings. I think if you mix rust powder, aluminum shavings, and Woodchucks crottles, you get some good bomb-grade Marmite. Seems Thor may be getting Jarnbjorn, an enchanted axe of Dwarven artifice. The PIE connexion comes from the doppelgänger of Thor in Slavic & Baltic mythos, Perun / Perkunas. He sometimes is depicted with a hammer, but more often he uses an axe. W00T! BTW wigging out with retrofitting alt cognates for Jarnbjorn, from PIE *h₁esh₂enó+*ǵʰwér- : Old *assaraferus ; *ἔᾰροθήρ ; Tocharian A *ysār- śaru ; Tocharian B *yasar-śerwe. Or maybe *ferassyr, *θήρἔᾰρ ‽‽‽‽ Oh my oh my!!!! Reading about Tocharian, and learning about, and learning to love Dvandva. Is that Tenxwwar Haryuça?? Talarian??? I'm thinking about switching my major to Linguistics. I'm currently in my 2nd year of graphic design, and it's not what I hoped it would be. Changing my major to Linguistics would mean changing my school, too. Is anyone here a linguist? What do you do exactly? Do you mean in terms of work or are you asking how to change subject? If you're asking about the kinds of subject you'll do, it really varies depending on the uni. For example Cambridge is quite strongly theory-heavy (and Generativist theory at that), while other universities are more concerned with the empirical/practical sides like psycholinguistics and phonetics. However you should definitely get a broad education in linguistics regardless of where you are, but if you want you could tell me where you're at and I'll have a look on their website and try and work it out for you. Thanks, but I don't want to make you do my work for me. I'm really just looking for people's personal experiences being a linguistics major or a linguist. I know there are lots of different areas of study, though. I'm particularly interested in computational linguistics, research (like historical linguistics), and field work (documenting endangered languages). I find it frustrating how I can't come up with good language names that could plausibly mean something. The names are either too compressed to be anything but a single morpheme or too clunky/large and its constituent elements too readily apparent. It's Fat Tuesday! I bought a couple boxes of paczki for the office and we greatly enjoyed them. The surprise favorite filling was apple (I didn't think anybody would like those, but everyone did! ); I did not get any prune. I don't care if it's traditional, nobody likes it. Actually, the place where I got them has quite a lot of flavors: apple, apricot, blueberry, cherry, chocolate, chocolate whip, vanilla, lemon, Bavarian cream, raspberry, strawberry, prune, and ricotta, of all things. (I didn't get any ricotta because they cost more, but I'm told they're actually really good. I'm skeptical, though.) I'd love to try rose, which I understand is also traditional, but nobody around here seems to sell it.